Shopping for Super 8 Busts? He's the alien from Super 8. Created directly from the 3-D model for the movie! Meticulously detailed Alien Bust features an ornate display base. 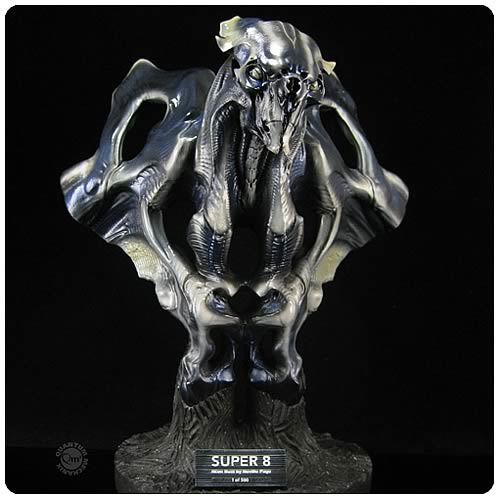 Created by artist Neville Page, world-renowned creature designer, this superlative Super 8 Alien Limited Edition Bust is taken directly from the 3-D model used to make the creature effects in the Super 8 movie! Measuring 10 1/4-inches tall x 4 3/4-inches wide and weighing approximately 3 pounds, the sculpture is the largest and most complex statue ever created by Quantum Mechanix. Both the master used to make the bust and the paint design were fashioned by Mr. Page. As a result, this piece has an incredible amount of detail and is extremely accurate. Each bust in this limited edition comes with an individually numbered plaque and a numbered certificate of authenticity signed by Neville Page. What a terrific edition to your monster collection! Limited edition of just 500 pieces. This extraterrestrial creature crash landed on Earth in 1958. Despite his superior intelligence and advanced technology, he was captured by the military and placed in a holding cell for observation and experimentation. That is, until he escaped and tore a path of destruction through a small town - his ultimate goal to repair his ship and return to his home planet. Ages 16 and up.